Roger Woodcock – the movement onto the left side and then the smooth fluid motion either on the run or set shot on the left foot was pure poetry in motion. In cricket terms it was as elegant as Mark Waugh through mid-wicket. Roger went to Wellington Road Primary and Norwood High School. Norwood High has had a rich association with Norwood FC; other fine footballers to do their schooling at Norwood include Bruce Winter; Neil Craig; the late Jim Thiel; Greg Turbill; David Palm; and Malcolm Ashwood. In 1969, Roger and Glen Rosser both went Under 19s, reserves and league in consecutive weeks and both played the majority of their careers on the same side of the ground – Glen on the centre wing and of course Roger on his famous right half forward flank. Robert Oatey was Norwood coach and Woody like many others regards Robert as ahead of his time re. skilled training drills. It was never just the old circle work. Robert also gave Norwood youngsters a chance and really the fruition of success down the track was born during the struggles of the ’60s and early ’70s. In 1973, North Adelaide just got up over Norwood in the first semi at the Parade a couple of appalling umpiring decisions in the last couple of minutes were a huge factor and I have never forgotten at the age of 10 it was the first time I heard my mother swear. I knew the unspeakable had occurred, but for those errors we will never know where we would have finished in ’73 and how the history of the Norwood FC would have been shaped. Bob Hammond arrived at the club in ’74 to add some toughness and additional resolve alas to lose the first semi to Glenelg. In ’75 there was a 18 round minor round where every one played each other twice (heaven forbid a fair and even program). Norwood finished minor premiers; after losing the first two games of the season we went on a 16 game winning streak. The Legs played some irresistible footy during this run only to lose the second semi to storm back and convincingly defeat Port in the prelim final. Greg Turbill dominated, kicking six goals. Grand Final day arrived. Our gun full back Ian Stasinowsky had broken his collar bone in the second semi and replaced by Jim Thiel (tragically neither are still with us) with fellow youngster Jim Michalanney as our bookend at full forward. As a Norwood supporter who can ever forget the Bays’ gun full forward Fred Phillis with his golden boots spraying his shots everywhere, kicking six points? But, hey fellow Redlegs what else was unusual in the grand final? Roger Woodcock kicked one of six right foot goals out of the lovely 602 sausage rolls he kicked for the Legs! What a sensational day – Phil Gallagher’s goal against the breeze in the last quarter was a yard away from me. I also remember my dad kissing this stranger when the final siren went – bloody attractive lady too! The Redlegs’ first flag in 25 years was one to savour. I remember listening to the radio summary and rushing home to watch the Big Replay. During this era a Port player might have been forced to leave the ground at Alberton with a broken nose. As usual, 28 John Wynne was the suspect. We can reveal it was our elegant number 10 with a back hander. I reckon the statute of limitations of time has passed and, hint, his brother was an umpire – well done Woody! Highlight of the ’76 season was the 106 point annihilation of Carlton in the night comp and in ’77 defeating East Perth in the Ardath cup night series final (Trevor Sapwell’s finest hour). Norwood had a huge build up in ’78 to the club’s centenary year including the controversial recruitment of Brian Adamson from West Perth. Sturt in ’78 were as dominant a team in SA footy history, only losing one game for the year. Fast forward to grand final day and Sturt are 29 points up at three quarter time. In an incredible comeback the Legs storm home to win by a point. Like Sturt supporters who struggled for years to accept the loss, so did I, made to go on a school camp. Grrr, I will get over it by the next millennium. Woody had been his usual remarkable consistent self with 42 goals to win the club goal kicking award (like many others he had a huge last quarter) and while the final score was 16-15-111 def Sturt 14-26-110, Sturt’s beautiful kicking for goal and Norwood’s superior fitness were both large parts in our centenary flag win. In ’79 we were disappointing to finish fourth. In ’80, under the coaching of Neil Balme, Woody had a fantastic year kicking 62 goals to again win the club goalkicking award and ohh so nearly pinch the flag from a dominant Port Adelaide side. When Neil Balme arrived at the club in ’80 of course we all knew Balme the player; the take no prisoners brutal win at any cost player. Over time Neil Balme’s greatest strength re. his communication skills was in some regards his biggest weakness. At times he was too trusting and not ruthless enough with some players. As with every club in which Neil has been a part of he will always be a much loved and revered figure at the parade. In ’81 Woody was by his own admission slowing down, struggling with a few injuries and having kids at home. He kicked his 600th goal against Centrals at the Parade. Ironically for one of the few times in his career playing full forward he was dropped for the last minor round game but due to a injury to Peter Laughlin he came back in to the side, had a fantastic first quarter against West Adelaide. But early in the second quarter his knee gave way and needing a knee reconstruction made the decision to retire an easy one (like any true gun forward he tried to get up and take his kick, alas to no avail). So ended a remarkable 267 game 602 goal career (the highest number of goals kicked by a non-specialist full forward in SA footy history). Now while any teams of the century create conjecture and controversy, how Roger Woodcock is not in Norwood’s team of the century is in mine (and many other Norwood faithful) a bizarre omission. When reportedly a large part of selection had meant to be picking players in position a strong case can be made for Woody to have been first picked. Roger’s other sporting love was Electric Light Cricket – a game invented by Alf Stone, coming into its own after the Second World War with the game helping to bring lost guys together. The RSL played a huge part, also the game progressed into being played in the parklands reportedly under interesting lighting to say the least. Roger played Electric Light Cricket for a remarkable 36 straight seasons and as always getting heavily involved being secretary for the last five years. Other prominent sportsman to play regularly were Wayne ‘159 on test debut’ Phillips and West Torrens, North Adelaide footballer and Gaza cricketer Steven Sims. Roger and his brother Brian continue to be very heavily involved in the Norwood FC. Roger is an active member of the Norwood FC history committee (praised by footy nationally for its sight and meticulous recording of individual and club history). The Woodcocks are also the driving forces behind the Norwood Past Players and Officials golf day each year. Sporting clubs need fine individuals and families to grow – the Woodcock’s are indeed such a family! At the start of the 2017 season Norwood decided to name the Wood St/RSL end of Norwood Oval the Roger Woodcock End – a fitting and deserved tribute! Love people to comment with their favourite Roger Woodcock memory and to share the article, thank you! Norwood’s on-line Redlegs Museum does a great job of recording Red and Blue blooded history – refer to this page on Roger Woodcock is a fine example. The above includes 40 minutes of brilliant Roger Woodcock highlights including the thoughts of Robert Oatey and Bob Hammond. A must watch! Lost me at the Norwood High School list of champions . One of the most accurate kicks for goal I ever saw. Rarely seemed to miss, when playing Port Adelaide at least. Kicked one of his trademark goals into a stiff breeze in the last quarter of the 1980 Grand Final to bring Norwood within a kick of an unlikely victory (prompting an SANFL official sitting just inside the arena at the northern end to jump up and celebrate). 600 goals is a LOT for a bloke who wasn’t a full-forward! A bit before my time following the ‘legs, Rulebook but Roger’s record speaks for itself. Ludicrous he is not in the Norwood team of the century. The Redlegs Museum is such an incredible resource – all hail to Roger and the other members of the history group. Enjoyable read thanks Malcolm. However I cannot agree with you about the result of the 1973 semi final! What relation (if any) is Roger to Ashley? He never missed on the run, may have missed the odd set shot. Did he ever kick a behind with his right foot? Interesting to think what may have been if that deliberate out of bounds free kick had not been paid against Norwood in the dying seconds of the 1973 semi final which North goaled from to regain the lead and go on to play that famous Grand Final against Glenelg. Bob Oatey having battled through all those hard years as captain coach with his own ideas ( he was an original thinker like his famous father) and developed all that young talent, finally had the team absolutely on fire at the end of the 73 season. However, the very poor start to that season had almost sealed his fate and I think the attitude at the end was that only a premiership could save him. Take away that deliberate out of bounds decision (which was paid about once a decade back in those days) and he could have had a crack at the premiership. Instead he was sacked and was never head coach at a senior level again. Hard to understand how such famous ex Norwood High boys like Woodcock and Ashwood did not make the Norwood team of the century. I was lucky enough to see almost all of his 267 games and without doubt he was one of my favourite players. We talk of his superb left foot, his movement and goal kicking, but I always thought, given his relatively light frame, his contested marking ability was as good as anyone’s too !!! During the bulk of Roger’s fantastic career I was working in the country so my recollections are mainly based on watching televised games and reading newspaper reports. Interesting to read your comments and those of Jeff Milton about Robert Oatey’s tenure as coach. I agree that much of the credit for Norwood’s resurgence in the 70’s was due to the solid foundation laid by him. Speaking of former NHS boys to go on and play for the ‘Legs in that era, Michael Gregg (the galloping broomstick) and Bruce Hines were two from my year level (along with Bruce Winter) who played at league level. Malcolm, the name Woodcock is not an every day surname. Was he related to Ashley the South Australian opener, who played a sole test, in the 1970’s? Not many better if any with the ability to kick goals like Woody. Great Norwood man. Remember the day Woody did his knee at Football Park. Sad day that was. Farmboy bit of fun thank you.Eric Woody just technically kicking Action was perfection and yes we nearly pinched,80.Dave agree with every letter and thank you for your help.Charlie and Glen surprisingly no relation.Milts spot on we will never no ( apart from the last line,Milts we can start raving on about the glorious a double one flag !) Michael couldn’t agree more,Woodys overhead marking was under rated. A great writeup as usual. A great insight to a legend of the Norwood Football Club and a great period in the 1970s. Go Legs! An annoying player to have playing against your team, always snagged a couple of goals that you could have done without. 600 goals, wow. The specialist. 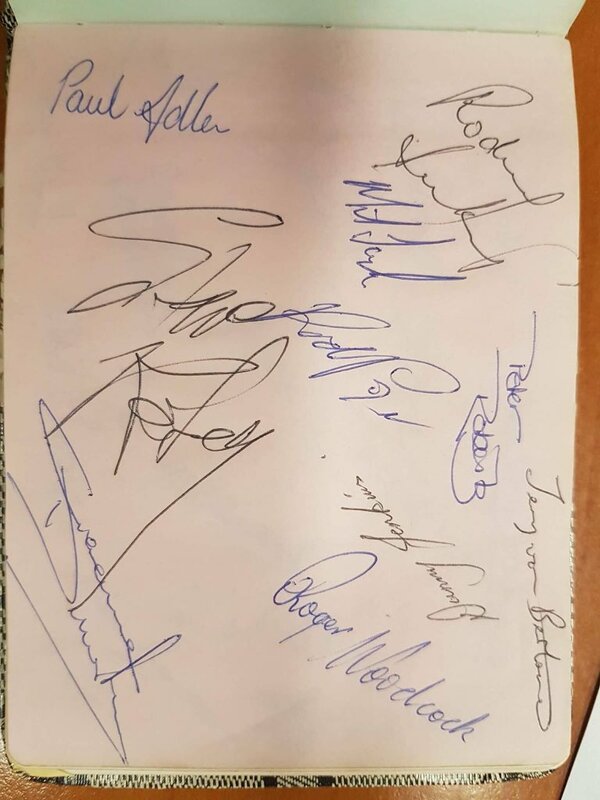 Had 3 favourite player’s as a kid – Kym Hodgeman, Michael Graham, and No 10 Roger Woodcock with that classical left foot. Was quite prepared to come up the ground “high half-forwards” they now call them, and Woodcock, Gallagher and Aish were all deadly finishers. Being a not-so-accurate left footer as a youngster, I always aspired to be as good as Roger, even wearing the no. 10 (if available) in any game I played. There ends any similarity with the great man though!! Malcolm, very enjoyable read and great highlights of a player I knew very little about. 267 games, 602 goals, wow. The Norwood team of the century forward line must be super impressive if a man with those credentials can’t get in. Well written Mal, they were great times! Hard to believe that a forward who can kick straight such as Woody is still hard to find in the modern era. Some things never change and kicking straight never gets old! Another good read Book, well done. Poetry in motion describes Roger perfectly. A great man off field to the younger players coming through. Another great write up, seems like he was a fantastic player for the club! Thanks Cameron,Swish a taxi may have been needed for Wilbur ( seeing,Wilbur playing the spoons was amazing one night ) Mark yes the Roger Woodcock end is fantastic and appropriate recognition thank you.Lachy amazing in the full time era of footy goal kicking has not improved and Woody would have en all for breakfast good taste re your favorite players.Billalas in reality I certainly don’t have any similarities to the players I mentioned either.Luke a v v v good footballer and if I have to name a player to kick for my life having a shot,Woody is probably the man.Sam the man yep spot on.Froggy a v imp point recognizing that,Woody was a significant help to a large number of younger players coming thru.Campbell thank you. Great tribute to a great stalwart of the Norwood Football Club. However, Roger’s greatest achievement remains to be that he has gone to the same high school as Malcolm Ashwood. Great memories Rulebook. I reckon as a kid I would have seen nearly all of those 267 games and ‘Timberdick’ was always one of my favourites. If I had some-one kicking a goal for my life I’d pick Roger I think. On the run without a doubt; set shot maybe Rocky Roberts. If the recipient of Roger’s solitary indiscretion was who I think he is it was well deserved. I recall Roger making a mess of one of the league’s best half back flankers in Glenelg’s Brian Colbey several times, whilst I seem to recall him really struggling against Port’s Tony Giles, who was a master of pushing Roger onto his Rt foot. I remember well the Carlton demolition night game. 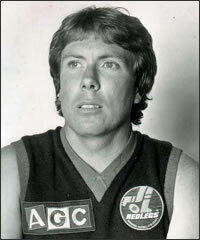 From (admittedly fading) memory Norwood swapped some jumpers before the game, so that Carlton players unfamiliar with Norwood stars by sight would be pushing No 10 ( Phil Gallagher for the night) onto his Rt side, and Roger woodcock, (No. 11 for the evening) onto his left. Big mistakes and coaching masterstroke! My son was asking me who from today’s game would be similar to Roger Woodcock and after discussion with a (Norwood fan) work colleague and I couldn’t really think of anyone. The polished specialist half-forward flanker seems to have gone the way of the ‘Resting Ruckman’ and ‘Ruck-Rover’. More’s the shame. I’ve got to be honest, I was a bit young and only have fleeting memories of Roger Woodcock. I remember him as a star, and certainly his #10 is ingrained in my memory. But apart from walking out of the cinema one summer’s day and my Dad pointing him out, hobbling past on crutches (I think it was summer 1980 and he’d just had groin surgery,) my memories are fleeting. That said, Malcolm’s article sent electrical waves to memories that hadn’t been ignited for a long time! Always a great read – I love the ‘non-football’ and little known bits that make it such an entertaining read. Sounds like a great footy player, wouldn’t mind borrowing his leg when lining up for goal. When I was running the Adelaide Oval Museum in the early 2000s Roger crossed the threshold one day and I remarked that he was the most exciting visitor I had received and gushed that I had seen most of his 600 goals for Norwood. I might say that Don Bradman had visited the museum on two occasions. As an item of interest (and a connection between the two) Roger’s father opened the batting at Kensington when The Don came in at number three. Another great read on another Great Norwood Legend .I have had the great pleasure of meeting Rodger on a number of occasions. As a Norwood supporter and through my position at Coopers. A more humble nicer man you would not meet. I was at the players sponsor night at the beginning of the season, working of course when Roger was presented by Paul with the Roger Woodcock End. The pride and emotion in his exceptence speech said it all. As for his career, that speaks for itself as well. With my Dad taking me to all those great Norwood games with all those great players from the early 70’s it was just an unbelievable experience, that will stay with me forever. 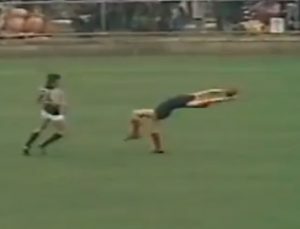 As for a great Woodcock moment, I will go for his right foot goal in the second quarter of the 75 GF, a defining game in not only the history of Norwood, but the Twenty Players, Coach, Officials and not forgetting the Reserves Premiers who did Norwood proud on that Mighty September Day. Well done Roger, Another True Norwood Champion. Well done Malcolm. Brings back some great memories Book – unfortunately missed a lot by playing with the Blacks, but clearly remember the 1973 final where we were blindly ripped off! Roger had to be one of the most reliable shots for goal I can recall – pity some of todays forwards can’t replicate his feats. A good article about a great Norwood man, Rulebook! I only saw him play on a few occasions, in 1980-81, but he was a favourite for the Redleg fans, being such a reliable kick for goal. I was there for both his 600th goal and the fateful game against Westies in the Elimination Final. It was a sad moment, which paralyzed the crowd that day. I remember that incident more so than the game. I have met Roger on several occasions, via a Sturt mate, Mal Ayliffe, who played many years of ELC with Roger. He is a great bloke to have a chat to about anything football. I have asked Roger about his knee injury – his version is somewhat different to what I thought it to be. You’ll have to ask him yourself, as I don’t feel its my place to tell it. Roger is certainly very passionate about the Norwood Museum which will be a great legacy of his (and the others involved). Overrated. Ashley Woodcock went much better. As a Kensington man can we expect a similar series on Browns greats starting with DG Bradman and Clarrie Grimmett? Neil Dansie. Bunger Hurn. Jeff Hammond. Enough of this Redlegs rubbish. It’s cricket season Rulebook. Time to elevate the discussion. I do remember watching him in the 70’s. Dad always said he was probably the most accurate kick he had seen watching footy in that era. ‘He would thread the eye of a needle ‘ was dads way of putting it. Fitting he has the northern end of the Parade named after him. I`m an Eagles fan from way back, mid 50`s, so although I know his name and the name of some of the others have to admit don`t know a lot about him. Also back in those days the Eagles and the Redlegs were always fighting to get into the 4. My memories of those days was Port and West in the top 2 positions and the Eagles and Norwood mostly in the next 2. Needless to say Norwood was my enemy! Good write up mate and if I followed your “Legs” I`d say great. Thanks Malcolm for taking the time and effort to write the article. You have put together a terrific package that has captured many highlights, and I know that my 5 grandchildren will cherish this in the years to come. I’m indebted to the Norwood Football Club, in particular Robert Oatey, for giving me the opportunity as a young, skinny kid to play this great game. Thank you to all the people who have made kind and wonderful comments on my career – it is very much appreciated. Great player watching as a kid on the outer with my Dad – smooth & graceful left-foot goal-kicker from that HFF. Deadly accurate. Loved watching him play. To kick 600 goals in 260-odd games from a HFF is unheard of in any era. Surprising IMO not selected in Norwood’s Team of Century as no peer in this position from what I saw or any player statistics before my time that gets close. I played Electric Light Cricket with Roger and Steven Sims with St George club in the city. Flipper retired the seadon be4 … Australian team duties took precedence I guess? Roger, a real character and a good bloke. Thanks Malcolm – they were great years. I loved playing for the red and blue. Even wished I could have my time again whilst I was watching my boy Tyson Burrows play for Payneham Falcons. He was captain for ten years with Garry Macintosh as coach. Tyson was also a raking left footer and reminded me of Woody. He won a couple of association medals, a number of best and fairest for the club and was recently inducted into the amatuer football league hall of fame. I rode every bump and flew for every mark with him but again he had a prodigious left foot drop punt that I couldn’t match. I never tried to teach him to screw punt either and he never asked. lol. Tyson started out with Norwood but went back to Payneham when a double family tragedy changed our lives. I think football and his close mates saw him through that tough time. Macca always thought Tyson could have been a great player in any league and there now great mates. I’ll always thank Macca for the time he put into Tyson and bringing out the footballer he became. Gary I to believe Tyson would have been a very good league footballer at the parade alas understandably it was not to be way more imp than footy.Tyson is a quality person in which quite rightly you are v proud thanks and all the best ! Love your work Rulebook. I can recall one day at the Parade R Oatey pulled the move of the century and actually played Woodcock in the middle Jezza Seekamp must have been injured. He was his elusive best when an opponent half back gave him a yard. On this day he played wide of the opposing centreman he had 6 up to half time drifting into the forward line unchecked !!! Why he wasn’t played in the position more ??? A great story is told by Woody when at State training Kerley kept on calling him Ashley…much to the disgust to Woody …”My name is Roger”…Reply: Ok Ashley !!! The theory of playing centremen on half fwd flank in those day kept Woody out of the State team… another selection error on their behalf. As per usual malc, a truly excellent read. I certainly agree with Stan the man’s comments about our state side refusing to play Woody for centre players- stupid. In my humble opinion Roger was the best and most consistent half forward in SA. What uncanny goal sense he had especially from snap shots.around the body. Incidentally I sat next to his older brother Don in the first term of first year (1C) at Norwood high. John Inglis was also in that class. In later years I got to know Bob Oatey who was then known to the lads as “Woff”. Like Roger, Don was a great bloke and it was a shock when he passed away..
Stan the man agree completely I would have used Woody in the middle more often and yep ridiculous he should have been 1 of the 1st picked for the state team and in my humble opinion in Norwoods team of the century and Gary I received a call from Tony Foster today re the omission of Don I will ring Woody tomorrow. I played with Woody in probably every game I played at Norwood. My favourite story about playing with Woody was at the Parade against Glenelg in I reckon 72 or 73. It was the second half and Brian Colbey was playing on Woody.. In those days as a defender you were judged on how many goals your direct opponent didn’t kick. Brian Colbey was a very good half back flanker and any goal Woody kicked he took personally. I took a mark in the right forward pocket and on a relatively easy angle. Colbey was standing next to Woody as a good flanker would do . Play had stopped and I was walking back to take the kick with Woody 5-10 metres away to my right. Woody and I had eye contact and I gave Woody the nod. He was hesitant but I nodded again. I handballed to Woody as he literally strolled passed me and kicked from 20 metres out on a very easy angle. I reckon it could have been the easiest of his 602 ! Colbey could not believe it and was not happy at Woody’s “free” goal! Somehow I missed this the first time around, RB. Yep, a great read, thanks Rulebook. Yes Roger Woodcock was my idol when growing up. Had a Brilliant kicking style when kicking for goal or passing to one of his team mates on the lead with his left foot. Should be in Norwoods team of the Century as a specialist half forward and his record speaks for itself with his 600 goals plus. Thanks for the memories Roger especially in 75 & 78 grand finals.